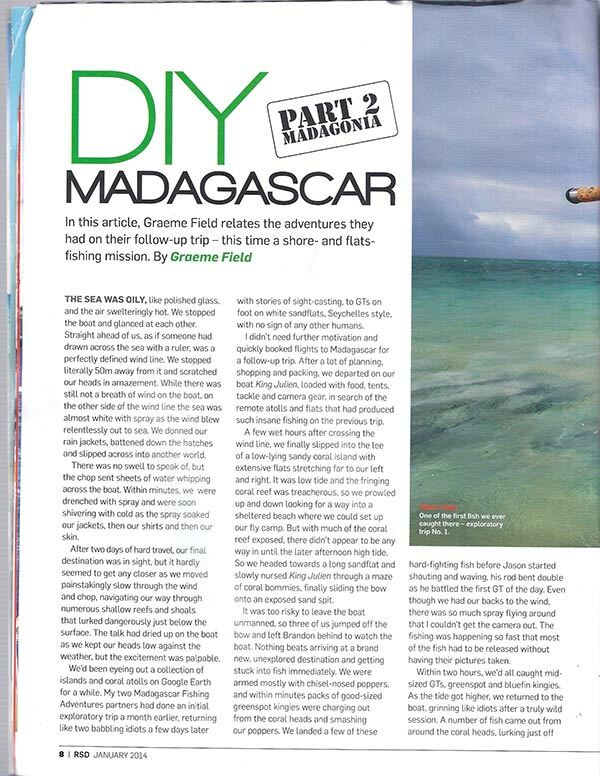 DIY Madagascar – Part 2 : "Madagonia"
The sea was oily, like polished glass, and the air swelteringly hot. We stopped the boat and glanced at each other. Straight ahead of us, as if someone had drawn across the sea with a ruler, was a perfectly defined wind line. We literally stopped fifty meters away from it and scratched our heads in amazement. While there was still not a breath of wind on the boat, on the other side of the wind line the sea was almost white with spray as the wind blew relentlessly out to sea. We donned our rain jackets, battened down the hatches and slipped across into another world. There was no swell to speak of, but the chop sent sheets of water whipping across the boat. Within minutes we were drenched with spray and were soon shivering with cold as the spray soaked our jackets, then our shirts and then our skin. After 2 days of hard travel our final destination was finally in sight, but it hardly seemed to get any closer as we moved painstakingly slowly through the wind and chop, navigating our way through numerous shallow reefs and shoals, lurking dangerously just below the surface. The talk had dried up on the boat as we kept our heads low against the weather, but the excitement was palpable. We'd been eyeing out a collection of islands and coral atolls on Google Earth for a while. 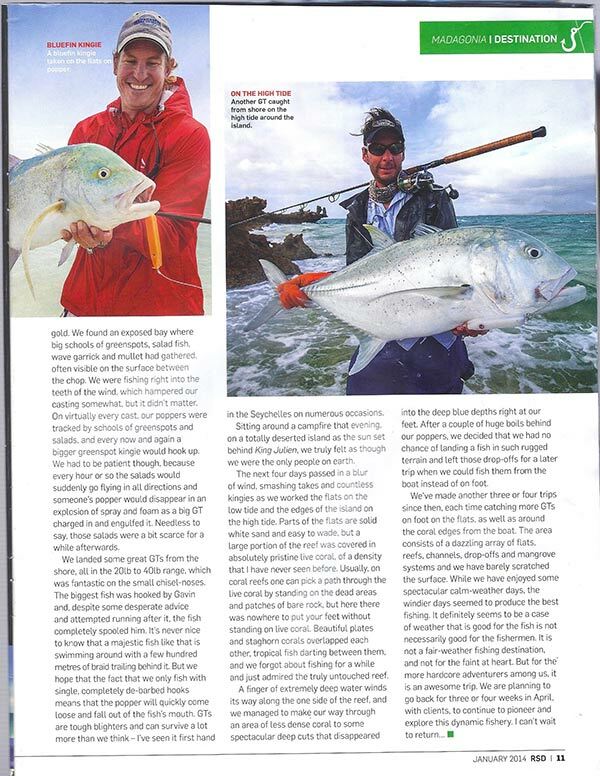 My two Madagascar Fishing Adventures partners had done an initial exploratory trip a month earlier, returning like two babbling idiots a few days later with stories of sight casting to GT's on foot on white sand flats, Seychelles style, with no sign of any other humans. I didn't need further motivation and quickly booked flights to Madagascar for a follow up trip. After a lot of planning, shopping and packing, we departed on our boat King Julien - loaded with food, tents, tackle and camera gear in search of the remote atolls and flats that had produced such insane fishing on the previous trip. A few wet hours after crossing the wind line we finally slipped into the lee of a low lying sandy coral island with extensive flats stretching far to our left and right. It was low tide and the fringing coral reef was treacherous, so we prowled up and down looking for a way in to a sheltered beach where we were planning on setting up our fly camp. But with much of the coral reef exposed, there didn't appear to be any way in until the later afternoon high tide. We instead headed towards a long sand flat and slowly nursed King Julien through a maze of coral bommies, finally sliding the bow onto an exposed sand spit. It was too risky to leave the boat unmanned, so three of us jumped off the bow and left Brandon behind to watch the boat. Nothing beats arriving a brand new unexplored destination and getting stuck into fish immediately. We were armed mostly with chisel nose poppers and within minutes packs of good-sized green spot kingies were charging out from the coral heads and smashing our poppers. We landed a few of these hard fighting fish before Jason starting shouting and waving, his rod bend double as he battled the first GT of the day. Even though we had our backs to the wind, there was so much spray flying around that I couldn't get the camera out. The fishing was happening so fast that most fish were released without having their pictures taken anyway. Within two hours we'd all caught mid sized GT's, green spot and blue fin kingies. As the tide got higher we returned to boat, grinning like idiots after a truly wild session. A number of fish came out from around the coral heads lurking just off the edges, but we'd also seen and cast to a few cruising GT's in knee deep water on the flats. With the higher tide we were able to get to the island and the deserted beach, so after securing tying King Julien up to a solid old tree, we tackled up again and went to explore the island on foot. It's a fascinating place, harsh, rugged, desolate and windswept. Jagged undercut rock edges fringe the exposed windward side of the island, just like Cosmoledo in the Seychelles. Low tundra like grasses struggle against the wind and dry climate, strange birds of prey hover in the skies and turtle nests line the beaches. Inspired by the harsh Patagonia-like ruggedness that contrasts with the tropical coral reefs of Madagascar, we dubbed our new discovery “Madagonia”. There is a high sandy ridge on the northern point of the island, the perfect viewpoint to spot fish and take photos from. I'd just reached the top of the ridge when Jason started shouting wildly at me. I looked up and there was a 40lb GT just cruising slowly across the white sand, 10 meters from the edge. I whipped the video camera out just in time for Jason to make the cast. The fish turned immediately, chased down the popper and smashed it right at his feet, but didn't stick. Instead of casting again Jason just looked at me, doubled over in exasperation at the near miss. “Cast again! Cast again!” I shouted over the wind because the fish was still hanging around, and he quickly gathered his wits and sent popper out again. Twice more the GT followed, but with less enthusiasm, before eventually cruising off towards the turtle grass and out of sight. A couple green spots and blue fin kingies followed as we worked our way around the island, before we again struck gold. We found an exposed bay where big schools of green spots, salad fish, wave garrick and mullet had gathered, often visible on the surface between the chop. We were fishing right into the teeth of the wind, which hampered our casting somewhat. But it didn't matter. On virtually every cast our poppers were tracked by schools of green spots and salads, and every now and again a bigger green spot kingie would hook up. We had to be patient though, because every hour or so the salads would suddenly go flying in all directions and someones popper would disappear in an explosion of spray and foam as a big GT charged in and engulfed it. Needless to say those salads were a bit scarce for a while afterwards! We landed some great GT's from the shore, all in the 20 – 40lb range, which was fantastic on the small chisel noses. The biggest fish was hooked by Gavin, and despite some desperate advice and attempted running after it, the fish completely spooled him. It's never nice to know that a majestic fish like that is swimming around with a few hundred meters of braid trailing behind it, but we hope that the fact the we only fish with single completely de-barbed hooks means that the popper will quickly come loose and fall out of the fishes mouth. 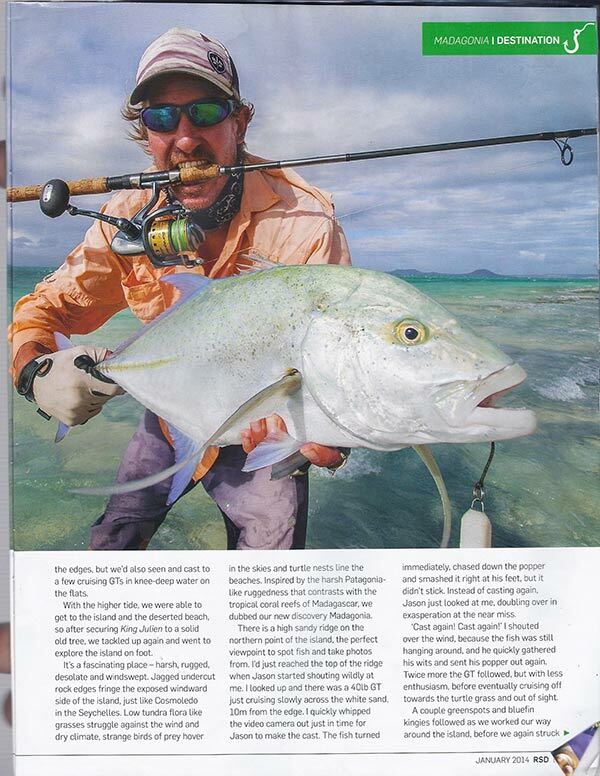 GT's are tough buggers, and can survive a lot more than we think – I've seen it first hand in the Seychelles on numerous occasions. Sitting around a camp fire that evening, on a totally deserted island with a couple of cold beers in hand as the sun set behind King Julien we truly felt like we were the only people on earth. The next four days passed in a blur of wind, smashing takes and countless kingies as we worked the flats on the low tide and the edges of the island on the high tide. Parts of the flats are solid white sand and easy to wade, but a large portion of the reef was covered in such pristine live coral, of a density that I have never seen before. Usually on coral reefs one can pick a path through the live coral by standing the dead areas and patches of bare rock, but here there was nowhere to put your feet without standing on live coral. Beautiful plates and stag horns corals overlapped each other, tropical fish darting between them, and we forgot about fishing for a while and just admired the truly untouched reef. A finger of extremely deep water winds it's way along the one side of the reef, and we managed to wind our way through an area of less dense coral to some spectacular deep cuts that disappeared into the deep blue depths right at our feet. After a couple of huge boils behind our poppers we decided that we had no chance of landing a fish in such rugged terrain and left those drop-offs for a later trip when we could fish them from the boat instead of on foot.